Yoga Classes are for All levels, no experience necessary! Drop ins welcome! Enjoy a yoga class or meal with us for Q50, and spend time in our spectacular space. Please, note, we do not allow unaccompanied people to walk around the property to protect the intimate, safe retreat space we have created for the guests staying with us, but you are welcome to join us for a class or meal, kirtan or Ecstatic Dance. Check-in time is 2pm. Please remember that cabañas must be checked out by 10am. You are welcome to stay for another meal or class for an extra Q50/US$7 and enjoy the day with us until your ready to leave (there is bag storage available in our office). Share your voice with our ecstatic meditations, singing ancient Mantra, Bhajan, Medicine Music and Heart songs in several languages to Awaken Love. Learn how to find support and balance with natural solutions through the use of essential oils, as a holistic approach to self care and healing. Using the ancient wisdom tradition of Ayurveda we will discover tools for optimal balance and a deeper understanding of Self. Come drink cacao and dance the morning away to soulful beats and smooth grooves in our Shiva Temple as an embodiment practice, lead by talented DJs and facilitators. 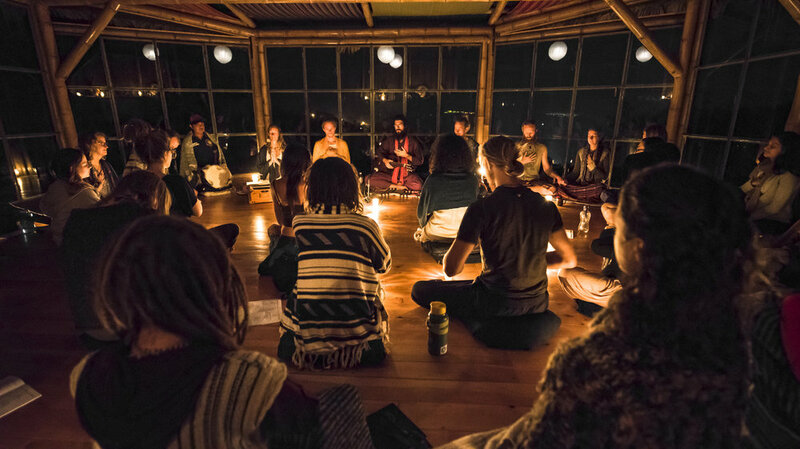 Come be with Jaya Saraswati for an intimate gathering and healing meditation, learning the essentials of Nada Yoga - the yoga of listening as we are serenaded in a unique shower of shamanic soundscape with instruments from all over the world. Hop into a silky sling-like hammock, which is draped from the ceiling to support your full body weight. Learn to fly and experience a unique way to practice asana, calm the mind and have some fun with Aerial Yoga. Aerial yoga is a type of yoga which uses a fabric hammock to allow students to perform anti-gravity postures. It combines traditional yoga with moves inspired by pilates, dance and acrobatic arts that builds on core strength, flexibility and safe alignment in your poses.